Nina Mae Keene (Chapman), 82, passed away peacefully on January 28. She is survived by 6 children: Vicki Daniels, Gary (Donna) Starnes, Mark (Tina) Starnes, Lisa Starnes, Joretta Starnes and Deana Tom. Grandchildren: Hope, Dustin, Amber (Jimmy), Pam (Derek), Rene (A.J. ), Blake (Sharlotte), Rachelle (Dennis), Marc, Derek (Jennifer), Matt, Natalie (Jon) and little Charlie. Nina had 22 great-grandchildren and 7 great-great grandchildren. Nina is also survived by siblings: Mary (Dave) Arthur, Allen (Jeanette) Bean, Jeannie (Pete) Wood, and Otis Keene. She was known by all, especially her physicians, as a “walking miracle” having survived pancreatic cancer and lung cancer, before a second bout of pancreatic cancer took her to her heavenly home. In her last days, Nina’s children collectively committed to keeping her at home and worked tirelessly around-the-clock to ensure her comfort. Nina had a passion for life surpassed by none and was truly loved by all who met her. Nina radiated with beauty, both inside and out. She took great pride in dressing and applying her make-up every day – even throughout the hardest days of her battle. She loved gardening and caring for her multitude of trees and exotic plants. She was known for her decorating talent, enjoyed reading romance novels, boating the ocean with her family and watching “The Bachelor” with friends/family every Monday night. She often told stories of her unconventional childhood which brought surprise and laughter at her zest to try just about any challenge that was put before her. 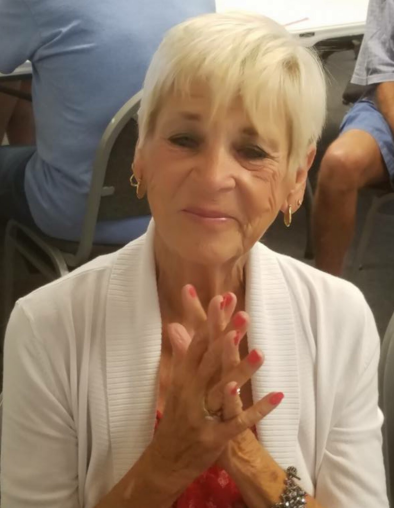 To say she will be missed is an understatement – her absence has left a deep hole in both her family and her community. Until we meet again, Nina Mae . . . .
A celebration of life will not only be in Florida, but an additional celebration of life will be held in Indianapolis, Indiana at a date to be announced.